An investigation by the Ryersonian found some eateries at Ryerson have a history of breaching food safety requirements. The Hub cafeteria, International Living and Learning Centre dining hall, Pitman dining hall, and the Ram’s Cafe, accounted for six minor infractions between November 2015 and November 2017, including three this year. According to DineSafe inspection results, Ryerson is responsible for “improper maintenance / sanitation of non-food contact surfaces / equipment” for all six infractions. Toronto’s DineSafe program launched in 2001 and publishes inspection results online. It requires establishments, including eateries at universities, to post the results “at or near the main entrance” for the public to see. A food safety inspection completed at Pitman dining hall in June this year noted that the operator failed to “properly wash equipment,” as the inspector found “evidence of mould” in the ice machine. Jim Chan, a retired Toronto Public Health (TPH) inspector, said the minor infractions at Ryerson should not be a “big concern for students.” However, Chan added that if the minor infractions identified by the inspector don’t improve or are not corrected, they may lead to more serious food safety violations. 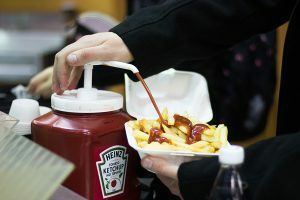 “Repeat infractions, whether it’s minor, crucial or significant means that they’re not paying 100 per cent attention to food safety check on their own regularly,” he said. After 36 years on the job, Chan has seen a fair share of major food safety blunders in Canada, including the Maple Leaf Listeriosis outbreak in 2008 and 2013’s case of the cronut burger at the Canadian National Exhibition. He said there always seems to be a lack of “self-assessment” being done by food services operating in large institutions. “Ryerson is not a repeat offender of food safety violation, we have had infractions for non-food contact related items,” Walter Da Silva, general manager of Ryerson Eats, said in an email. “Our primary concern is that the food we serve is prepared to the highest standards using quality products and ingredients and as the very minimum we will comply with all relevant legislation and approved codes of practice,” Da Silva said. Zain Alkhouri is a resident of Pitman Hall and one of thousands of students who eats breakfast, lunch and dinner at the residence cafeteria. “If we do ever get sick, missing class is not really an option, and we might fall behind,” Alkhouri said. Campus eateries may let issues around food safety slide by because they might not think students care, he said. Food safety violations are not just isolated to just Ryerson, they’re common among post-secondary campuses. A recent CityNews investigation accounted over 200 violations between 2015 and September 2017 at 44 on-campus establishments in Toronto. Earlier this year, over 200 students at Humber College suddenly became ill due to a norovirus outbreak. Those who contracted the virus experienced a range of symptoms, including vomiting, diarrhea and nausea. A public health inspector can close a food establishment if a health hazard is recorded, in which case a red card is issued, Chan said. However, the public health inspector has no authority to “revoke” a food business license. During his time with TPH, Chan said about six or seven food establishments went through the Toronto Licensing Tribunal process. None of which were from campus eateries. If consumers notice employees not washing their hands or having dirty fingernails, that’s an indication of how bad the kitchen in the back is, Chan said. But he also said a good operator will always learn from their mistake. “If [the operators] see some violation being documented by the health inspector on the inspection report, the operator should know that it will go up on the website, and eventually onto social media,” he said.